This book has really been hyped up around the book blogging world and I was expecting great things from it. Unfortunately within the first fifty pages I nearly threw it out the window. I really did not enjoy it until I got past the first hundred pages. I bet you are wondering why I didn't give up on it, well I hate to be defeated by a book and thank god it got better. Nora Grey is the school nobody really. She tries not to appear on the social radar and has no interest in boys at all. Her life is quite normal until Patch turns up in her life, sending her all a quiver with his easy smile and soulful eyes. From there first meeting, really terrifying events begin to happen to her and leaving her quite traumatised, yet when she goes to report them to the police, all evidence has disappeared. Nora feels that Patch may have something to do with it. He is everywhere he shouldn't be and seems to know too much about her. Nora sets out to get the truth about Patch and ends up becoming embroiled in a battle that has been going on for centuries. 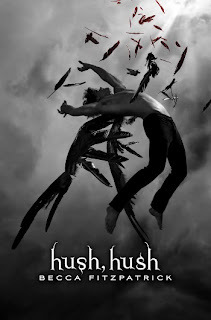 From the beginning of this book, it is quite evident and easy to work out that Patch is a fallen angel, yet it takes Nora half the book to realise it. I found myself getting really frustrated. with her obvious blindness. Patch does not come across as your leading man either, which led to me really not caring whether they ended up together or not. He comes across as really arrogant and I felt like I wanted to slap him. Luckily the book got better, a hell of a lot better, once Nora realised what was going on and who were the bad guys, the book really picked up in speed and I couldn't finish it quick enough. I was really captivated by it from that point on and the ending definitely wasn't what I expected. The book is worth a read, if you have time to slug through the first hundred pages. If you like vampires, then you will enjoy this. I tried to add everyone else's reviews but Google Reader disliked my attempts, so if I have missed you out, put a link in my comments and I will add it to my list. Every time I see that cover, I still think 'wow' - but I also had to go back and read my own review to remember what I thought of the book. It just wasn't a book that has that stayed with me. Maybe you knew he was a fallen angel because you'd seen the cover :D.
Unfortunately I don't like vampires, so I don't think I will pick up the book. But I'm always on the look out for the right YA to come along. I read all the blurb about Ken and Barbie, laughed and thought wow I have to read this. After your review I'm now in two minds though. Thanks for being so honest. I'll keep that in mind when I decide to read the book. Thanks for the review! You know what? I just have absolutely no desire to read this. I just don't know if I want to read this or not....Your review has perked my interest a bit more ;) But before that I really had no desire to read it...I've been turned off by the cover for some reason...I don't know what it is but it just doesn't appeal to me...hmmm, maybe I'll check it out at the library after reading your review! Clover - it definitely isn't the best YA that I have read, that is for sure. Mee - go for Ruined by Paula Morris instead, that was a fantastic YA book. Blodeuedd - it does get better. Petty Witter - I wouldn't rush out for it. Amanda - going by the books you read, I really don't think this one would be for you either. Chris - lovely to see you on my blog. It took me a long while to get around to reading this one, because of the bad reviews, but it wasn't as bad as I thought it would be. I have a bit of thing for angels at the moment, so that was the main reason for reading it. Katrina - drink the Baileys first, then the first 100 pages should fly by! Hi Vivienne - thanks for linking to me. I seen you reviewed this so had to see your thoughts. I really enjoyed it but I know what you mean about some of the obvious stuff that Nora just didn't pick up on or her constant ability to walk into danger... her character reminded me of Bella in the Twilight series. I'm not terribly interested in vampire stories, nor books which improve after the first 100 pages. Vivienne, thanks for your honest review. This book isn't about vampires. I'm not sure where people keep getting that idea. Anyway. I must politly disagree. I really enjoyed this book, and think I'm a pretty tough critique but I found myself pleasantly surprised. But that's just me. The book is worth a read, if you have time to slug through the first hundred pages. Sheila - your right,Nora was a bit like Bella. I just found her annoying. Suko - this isn't about vampires. It is about fallen angels, but hey don't worry. Sarah - I am not sure why everyone is mentioning vampires as there isn't mention of them in my review. That is fine if you disagree, I really don't mind as we all find different things in different books. Wisteria - you know me, always to the point! good for you on not giving up on it. even though the start is slow, I do want to read it.